Lately, I have been thinking a lot about roller coasters and how much going through change is like riding a roller coaster. 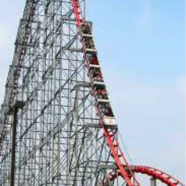 Now, I admit, I am probably not the first person to think change is like a roller coaster, but a recent experience I had at an amusement park led me to think more deeply about this analogy. As many of you know, I was coaching a girls’ basketball team last summer. One of our activities was going to an amusement park. In my mind, this would be exciting for the entire team, but in reality there were very different emotions displayed just from the mention of the word roller coaster. Some of the girls were excited, some were scared, some were already nauseous, and a fair number of the players were bored. This got me to thinking about different reactions to change. Often the creators or planners of change are the ones that are excited. They know the reasons for the change, have been involved in designing the change, and also know the benefits of the change. But we forget that wasn’t always the case. At some point, even the designers of the change had to be convinced that it was a good idea. Yet, by the time the designers announce the change to the organization, they often act like it was their “good idea” all along. This creates lots of conflict in the organization, as others feel differently about the change. Some people might also be excited because (back to the roller coaster analogy) they are actually on the ride, or are next in line. But think about where other people are in the spectrum of acceptance. Some are at the beginning of the line and, while people are talking about the ride, they can’t even see the ride or hear the excitement of other people on the ride. All they see are a lot of people in front of them. They might be impatient (why won’t this line move) or bored (no one likes to wait) or maybe even distracted (I don’t remember why I’m in this line anymore). Maybe people aren’t even in the line; maybe they are in the parking lot. They can’t even imagine what the roller coaster looks like. They just see a lot of people milling around, complaining about the cost to get into the amusement park. To them this might be a day of excitement (they will eventually get to ride the roller coaster) but they may also be dreading the ride a bit (hopefully I won’t get sick on the roller coaster, hopefully this won’t cost too much money, hopefully I won’t get sunburn waiting in the line). The biggest conflict might come from people actually on the roller coaster. I remember when my son was in kindergarten. The year-end school party was at an amusement park. While his other kindergarten friends rode the ride, he was too scared and didn’t. Next year at the amusement park, while he was still afraid, he was determined to ride the roller coaster. When you looked at him, you could clearly see the fear on his face; however, his determination kept him moving. Sometimes we see that at work. The company announces a major change. People that are excited about it are surprised or frustrated when others don’t seem as excited. Then they interpret the lack of excitement as being “anti-change”. In summary, as you are going through major changes, you can do this exercise. Write down the key people that you want to be involved in the change. For a work change, they could be colleagues, subordinates, or your boss. In your personal life, they could be your closest friends and family. Where in the roller coaster analogy would you place them? Are they on the ride with you? Waiting in line? Or maybe in the parking lot? Hopefully, this exercise might provide some insight into the strategies you could use to get them to participate in the change.